OPTICS COMPANIES have conditioned shooters to expect new products every year that are useful, distinctive, and eye-catching, but that are just different enough from the previous year's models to gin up demand for the new glass. 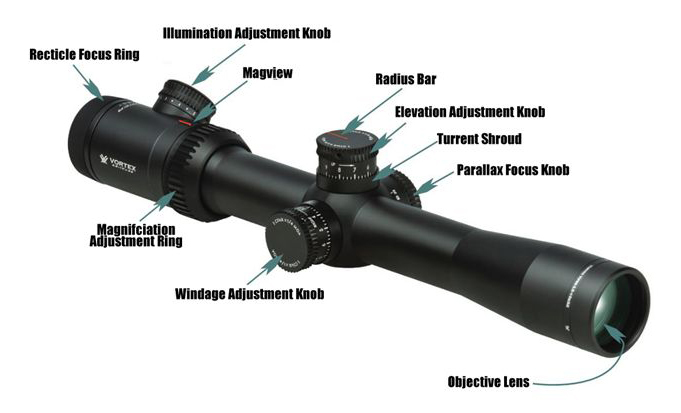 In recent years, that dynamic has created a galaxy of niche riflescopes — low-magnification battle scopes configured for AR15's, ultra-high-power scopes designed for long-distance shooting and snipers, and turrets and reticles tuned not just to specific calibers, but to precise bullet weights and velocities. Some of these specialty scopes are very capable optics, but they raise a question: How versatile are they? One appeal of a riflescope isthat it can be mounted on mor e than one rifle and can be used for more than one shooting situation. This year's test is full of versatile scopes. These all-'rounders have reticles in the second focal plane with a few simple elevation and windage references. They have capped turrets with standard ¼-inch clicks (though we're seeing MOA adjustments more frequently). They have a wide zoom range, generally 4- to 5-times magnification, and objective lenses of sensible diameters, generally not exceeding 50mm. We don't know whether riflescope producers have run out of niches to fill, or whether shooters are simply clamoring for every - duty optics, but we're happy to see versatility as a core value of this year's crop of riflescopes. CREATED BY ALUMS of Nikon's sports optics division, Tract launched this year with optics featuring premium glass and sweet controls, and a distribution strategy that bypasses retailers and sells direct to consumers. Tract's freshman riflescope should generate plenty of buzz. The Toric had one of the highest combined low-light and resolution scores in our test, thanks to its high-transmission Schott glass and first-rate coatings. The 1-inch scope sports a distinctive graphite finish and comes with a high-profile lockable turret with zero stop. Its clean and intuitive second-plane BDC reticle is compatible with Tract's online ballistics program. FOR SHOOTERS who love to "get on the knobs" to dial their reticle to a bullet's impact point, this high-performance, high-priced Swarovski is just the thing. The lack of holdover references on the second-plane duplex reticle is compensated for with the most wonderfully precise turret controls in this year's test. The big, hand-filling elevation turret dials 116 MOA of adjustment and the window that counts up (or down) turns of the turret helps avoid the "revolution confusion" that can afflict long-distance shooters. As long as you have the time and conditions to dial in a solution. this 30mm Swaro is the ticket; it's less useful for more dynamic shooting situations. A LOVELY OPTIC, this new high-magnification riflescope turned in the top low-light score in our test, owing to very good glass and coatings and a light-gobbling 56mm objective lens. Optically, it's a marvelous instrument. But as a precision-shooting device, the 30mm Leica left us wanting. The magnum BDC hold-over reticle, in the second focal plane, features adequate mil-based holdover and hold-off references, but the single rotation of the elevation turret limits its a long-range capability. You can get around this constraint by using ballistics software. But a premium-priced scope, especially one configured for long-range shooting, should have more utility. THIS is MORE of a target-shooting scope than a hunting optic. That utility was most clear when its reticle was most obscure: during our low-light test. The etched BDC reticle in the second focal plane is simply too fine to see aiming points in diminishing light, at least at 8X (the magnification that we put all rifle-scopes on for our low-light test). The precise red illumination helps reticle visibility, and the German glass is bright and clear. We loved the lustrous black finish of the 30mm tube and its mounting dimensions. But the very fine crosshair is better suited to F-class shooting in daylight, not hunting distant animals in low-light conditions. THE SECOND PURPOSE-BUILT precision scope in this year's test (the SIG is the other), the ATACR is a new configuration in Nightforce's venerable tactical line. Previous iterations were smaller (42mm) and larger (56mm), but this 50mm version is, like Goldilocks' porridge, just right. We liked the capped windage control on the 34mm tube, and the 13-inch length is sized right for a wide variety of rifles, including ARs. The second-plane MOAR reticle features 120 MOA of elevation adjustment, and one of the best zero-stops and illumination systems in the business. Optically, the Nightforce demonstrated a bit of glare, but the battle-ready controls in the aiming system will make this ATACR another favorite of the precision-shooting community. STYLISTICALLY, THIS ZEISS IS flawless. It's graceful lines and low-profile controls make the gargantuan 36mm tube seem smaller than it is, and the sophisticated illumination control is precise and subtle. Its optics are first-rate. But the great promise of this new scope—that it represents a new wave of elegant long-range shooting instruments—simply is not borne out by its functionality. Its turret and reticle system limit its utility to about 600 meters. An innovative zero-stop adds to the positive elevation controls, and a series of engraved elevation rings that match most standard and magnum calibers enhances the precision of the scope, if not its range. A SMART, LIGHTWEIGHT, and versatile scope, the heart of the new Vortex is its second-plane HSR-4 MOA-based reticle, useful for holdover shooting. The aiming system, with 55 MOA of elevation adjustment, features a bold horizontal crosshair with windage references intersecting with a vertical crosshair that has intuitive references. The 1-inch tube contains very good optics, the Vortex tied with the Minox for top optical resolution score, surprising because of the amount of dust and grit we discovered inside the works of the argon-purged tube. The 42mm objective and ample mounting dimensions give this a very good versatility rating. THE MOST INTERESTING element of this solid 30mm riflescope is what it doesn't contain. Trijicon made its reputation with an innovative illumination system that utilized both fiber optics and the element tritium to light up its reticle. The AccuPower uses a standard battery-powered module to illuminate the center crosshair. It's a fine system, and the illumination is subtle and serviceable, but it lacks that space-age wow that defined earlier Trijicons. The rest of the scope is fairly standard stuff: a familiar configuration and controls that performed well in our evaluation without particularly impressing the test team. LIKE MOST NIKONS. this new iteration of the Monarch brings solid performance at a fair price, though it won't bowl shooters over with innovation. Its name conforms to its configuration—5X magnification range - but the Monarch line also features high-end extra-low-dispersion glass and a simple rezeroable elevation turret. The Nikon's reticle is an enhanced version of its stacked-circle holdover BDC. New for this year are windage references on both sides of the elevation post that are calibrated for a 10mph crosswind. As with most second-plane reticles, the subtensions work at the highest magnification. WE'VE SEEN THIS optic before. It's the Czech-made Euro of previous tests, and we've lauded its excellent optics and precise controls. New this year is an innovative—and ambitious—turret system that allows shooters to swap out custom turrets and mount this scope on just about any rifle they own. Cabela's will offer buyers of this scope free custom turrets for life. You send Cabela's the specifics of your caliber and bullet ballistics, and they'll send you a color-coordinated turret for the Instinct. Carabela' new Instinct scope features color coded turrets tuned to specific bullets and loads. Swap out your .338 Win. Mag. for a .257 Roberts, or a .223 for a .30/06, and once you dial in the range on the elevation knob, you should be able to drop bullets into targets at ranges to 1,000 yards. In practice, we found the turret system to be a little buggy. Our custom turret—for a .300 Win. Mag—was calibrated in reverse direction to the elevation controls, so as we dialed up the yardage, the point of impact actually declined. We worry that the fine gearing in the aluminum turret can be stripped with hard use. But once Cabela's perfects the mechanics, this will be an appealing option for shooters and hunters. WE ARE TOO cynical to proclaim a "perfect" riflescope, but we're also experienced enough to recognize a first-rate optic that can handle a wide range of shooting tasks with an equally high level of aptitude for each. That's the advantage of this elegant new workhorse from Burris. The Veracity brings some very smart and balanced capability to a product line that has been mired in mediocrity for the past several years, elevating it to near perfection. The Veracity's most remarkable attribute is its MOA-based aiming system, anchored by a first-plane reticle that Burris calls the Ballistic Plex E1. The reticle features holdover points out to 600 yards. Because it's placed in the first focal plane, the reticle's subtensions don't change with magnification, and you can combine a turret-based aiming solution with reticle holdover. A combined "right-on and close-enough" approach, if you will. The E1's etched aiming points are clear at any magnification above about 6X, but the bold taper to the plex also makes the scope quick to acquire targets at lower power. The Veracity scored high in our low-light and resolution evaluation, and we liked its positive controls, ample mounting dimensions, durable construction, and incredible value. WHEN SIG SAUER started hiring senior managers away from established optics companies a couple of years ago, the industry quavered with apprehension at the products it would launch. This year's excellent Tango6 confirms its competitors' fears: This SIG is a first-rate, formidable precision optic that we expect will start displacing established brands in many shooting disciplines. It's also a lot of scope. Built on a 34mm tube finished in a stylish graphite, the Tango6's first-plane illuminated milling reticle features nearly 80 MOA of elevation adjustment and big, beefy controls with a proprietary zero-stop. We wanted more numerical references etched on the reticle (also available in the second focal plane), but that was our lone criticism of this investment-grade, hard-duty scope. CONSIDERING THAT THE riflescope field has been dominated by a sort of arms race in recent years, with ever-higher magnification ranges and complicated reticles, this pared-down, elegant 30mm offering from Meopta is a refreshing throwback. It's a fixed 8X with a fine (and finely illuminated) center aiming point in a second-plane duplex reticle. The configuration tilts toward low-light conditions, such as you might find in a European high-seat hunt. The big 56mm objective gobbles up light, and because the illumination can be dimmed to the faintest intensity, hunters can see their aiming points even under very dim conditions. LEUPOLD HAS REDESIGNED its venerable VX-3 model to address one of the most misused terms in optics: "light transmission." Companies routinely claim implausibly high transmission, basing their claim on only one or two of the most visible wavelengths of light. Leupold's new Twilight Max Light Management System claims to emphasize transmission across the light spectrum. We noticed good contrast in the evening but the VX-3i's low-light performance didn't wow us Mechanically, the 30mm VX-3i will be familiar to Leupold fans. A second-plane duplex reticle is retained in the model, and the simple controls are similar to previous iterations.